Raaga.com: 14 years later Mumbai rocked by another Salman Khan kind of hit and run case! 14 years later Mumbai rocked by another Salman Khan kind of hit and run case! 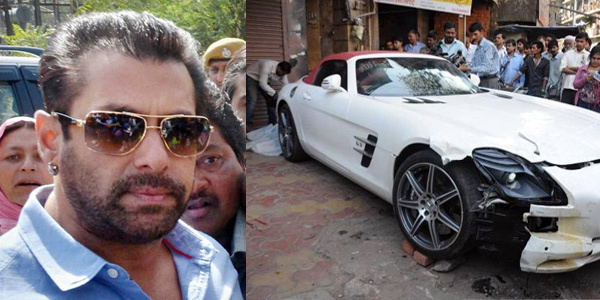 On the horrifying night of September 28, 2002 Bollywood actor Salman Khan’s white Toyata Land Cruiser crashed into the pavements near American Express Bakery at Hill Road at Bandra, killing one person and injuring four others. Salman Khan was arrested and released on bail. The case run for over 13 years and eventually the honorable Mumbai High Court on December 10, 2015 gave clean chit to Bollywood actor Salman Khan over-ruling Session’s Court’s May 2015’s order sentencing him to a five-year imprisonment. The scene shifts to Mumbai’s yet another popular business hub, Masjid Bhandar, with a similar backdrop. On the chilling winter night of January 22, 2016, a millionaire driving his posh Mercedes car mercilessly runs over some people sleeping on the pavement of Mohammed Ali Road. Four women and a child are inured and admitted to the nearby JJ Hospital. Two of the injured are reportedly critical. The brutal killer once again, like in the case of Salman Khan, flees away from the scene of crime. He is later arrested and released on bail…. The question is how long can cases of rash driving be ignored as ‘minor’ crimes? A study of few lethal cases of rash driving like the Alistair Pereira case, who killed seven people by running over a group of construction workers who were sleeping on the road in 2006 or Sanjeev Nanda, son of indurstrialist Suresh Nanda, crushing his BMW through a police checkpoint, killing six people in 1999 show that the culprits have never been given harsh punishment more than five years! In both the above cases the culprits have either been in jail for three years (Alistair Pereira) and two years (Sanjeev Nanda). The Salman Khan case too made mockery of the law as the Mumbai High Court acquitted Salman Khan of all charges in the 2002 hit-and-run case and instead slapped the Mumbai Police for poor investigation of the case!!! Thus until and unless the law of the land tightens screws on the culprits of rash driving with severe punishments and early judgments there is little hope to control the raise of rash driving in India!